I’ve been busy busy getting ready for my trip to Boston and Rhinebeck! Mostly this involves running around and buying new stuff for traveling – something about taking a trip really brings out the shopper in me. I need a new water bottle! tote bag! pj pants that can be seen by other people! case for my new camera! etc etc etc. Now I’ve got a suitcase full of Coffee Crisps and I’m still working on my knitting after a bit of a Rhinebeck sweater disaster. Yeah, it looks ok. But trust me, this was NOT GOOD. The shoulders were WAY too roomy for little ole me, which I really only discovered after sewing in the sleeves and knitting the collar (which also needed some tweaking). Total fail. So I ripped the collar, took out the sleeves, took apart the shoulders, ripped the upper body back to the the underarms, ripped sleeve caps, and rejoined it all to work a seamless set-in sleeve. It’s blocking (again) now and I think it’s MUCH better! Plus I got a pretty pretty ribbon to put in, which makes me happy about it. It’s not perfect, but it’ll do for now I think! and now I’m working on finishing up a scarf – just a few loooong rows to go. Now if you’ll excuse me, I’ve got to finish packing those new pj pants and get to a Thanksgiving dinner! Happy Thanksgiving to all my Canadian friends and readers. 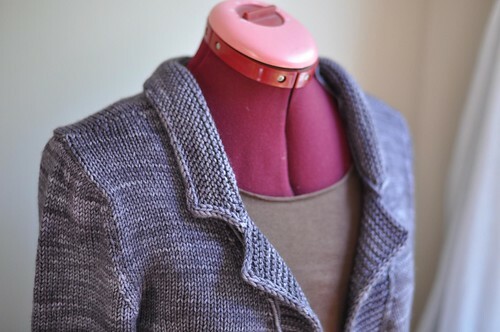 I love the garter stitch details on that sweater, very sharp! I have to rip back a lot on the yoke of a sport weight top down sweater I’m working on. I don’t even want to count how many hundreds of stitches are on the needle. super cute! i can’t wait to see modeled shots! The little ribbon is super cute! I love those buttons you used. They’re very pretty. Happy Thanksgiving! Looks like all is good now! 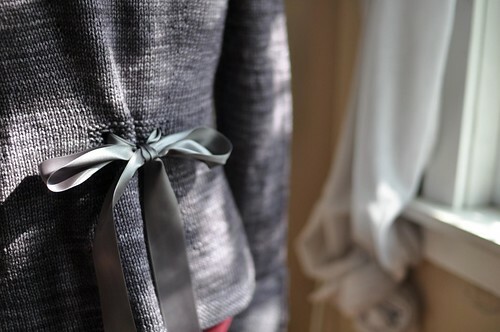 Love the little buttons and ribbon. Nice finishing touches! Right there with you on the new PJ pants–my pajamas are mostly in the not-to-be-seen category, too! I can’t believe you had the jam to rip out finished sleeves *and* a collar. That’s dedication! I look forward to seeing the finished, improved product! It looks fantastic. The ribbon is a great touch. Ribbon looks amazing! 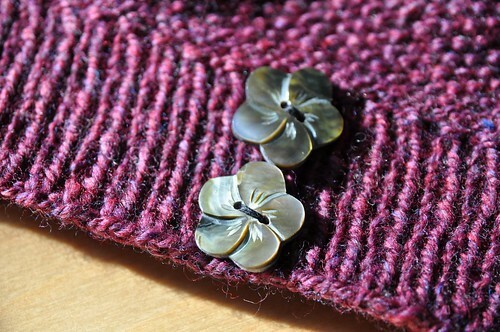 and those little flower-buttons. 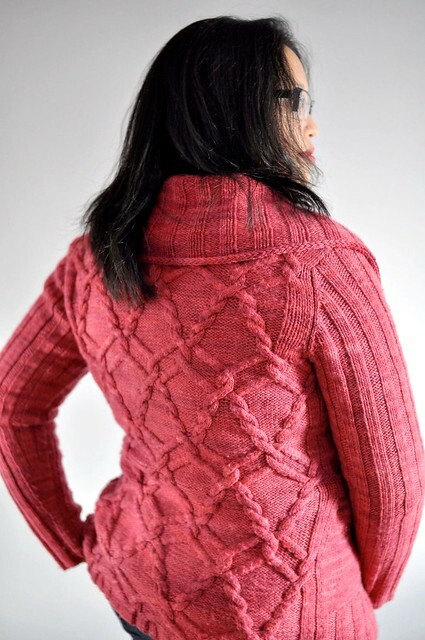 I love your patterns, and recently I purchased the Bellevue Cardigan. I see it’s done with seamless set-in sleeves, which I would love to achieve. After reading thoroughly and many times your pattern, I still don’t get it. Do you have any resources to help me understand the process ? your dress form looks very interesting. i have been looking for one for a long time. can you tell me where you got it and are you happy with it? i would appreciate it.